A versatile addition to the VIXIA G-series family of camcorders, Canon U.S.A. Inc., a leader in digital imaging solutions, today announced the Canon VIXIA HF G50. The camcorder is the first VIXIA G-series camcorder to feature 4K 30P recording and is an ideal tool for advanced amateur filmmakers, wedding videographers and student reporters. Featuring a genuine wide-angle Canon 20x (29.3-601mm)* optical zoom lens, the VIXIA HF G50 provides a well-rounded feature set at an affordable price point. The VIXIA HF G50 camcorder records 4K UHD/30p (4:2:0 8 bit) and 1080p Full HD (4:2:2 10 bit via SDI/HDMI Output) in MP4 format to dual-card SD card slots with dual and relay recording. Users can also record in slow and fast motion interval from 0.4x to 1200x providing users with additional creative possibilities. To help provide enhanced image quality over its predecessor, over sample HD processing can be utilized with information obtained from the 4K 1/2.3-inch sensor and the DIGIC DV 6 image processor. The VIXIA HF G50 camcorder’s Intelligent Optical Image Stabilization five-axis system Dual-Pixel CMOS AF provides users with powerful image stabilization via a Dynamic mode, which reduces image distortion even when shooting while walking. By adopting the 8-bladed circular aperture applying the EF lens technology, it is possible to take pictures using natural beautiful bokeh. The ergonomically designed and highly portable camcorder has a 3-inch LCD touch panel screen and tilting, user-friendly, high-resolution color Electronic View Finder (EVF). 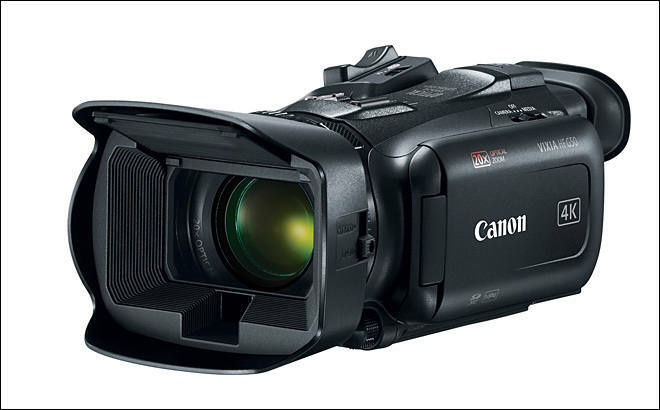 The Canon VIXIA HF G50 4K UHD video camcorder is scheduled to be available in April 2019 for an estimated retail price of $1099.001. For more information, please visit, usa.canon.com. Sorry--I meant to say ax700. The new ax700 really is very good. The IQ is really good, the focus is really good, excellent camcorder. I used to be a Canon fan but they are still behind. Having said that, the ax100 is also very good. But major improvements in the ax700. AX100 stabilization is worse, I think. 8-Blade Circular Aperture + Dual SD Card Slots are also nice. It is specially made small sensor camera that you can handle to someone and get nice result. In every almost every way worse than the Sony ax100, except the price. 1/2.3-inch 4K UHD CMOS sensor--pass.